Looking for a new Hot glue gun, mine died , it was an Ad tech 2 Temp Model # 401, I ws looking for something that will last more then 6m of good solid use. I just bought mine in the local craft store for $5... I know HobbyKing has one that will run off 3S LiPo's! +1 on that gun from Michaels w/ coupon. Takes a while to heat up (don't they all), but it can gush glue when it's hot, is easy to control flow, and comes with 4 nozzles. Also has good thermal momentum, so it can be unplugged for a minute or two and the glue still flows. I don't trust low temp glue here in the south, but the high temp (with a dot of Gorilla glue here and there for to make it permanent) works well. YMMV on the glue, but the gun is good. Craftydan, I've moved on to foam tac for pretty much everything, but I'll remember to spot weld with gorilla glue the next time I Use hot glue. Works the best for motor mounts too. It really depends on what I'm gluing. If it can be calmped or pressed, I use straight Gorillia Glue and walk away for 1/2 an hour. If it needs to be held while drying (like folding a curved armin wing), I use the hotglue + spotwelds of GG. Once the HG dries, I can let go and it'll hold the joint for the GG to set. I've yet to have a backseat self-mod on a wing built this way. Foam tac or any other heat-insensitve glue would likely work the same for the spotwelds. I prefer GG because it foams into the board when clamped, embedding deeper than the surface with the hardening GG. Makes the joint far stronger than the foam around it for a good 1/8-1/4". Of course, I expose patches where I use GG to get foam-foam joints. OK then getting a new gun, I use GG with water as a gap fillier. GG on motor mount backing is pretty good for added light weight strength. Haha, I have fond memories of using gg as a gap filler! GG is very light and durable, but It is hard to sand and pieces tend to chunk off! So I ended up sanding it and using lightweight spackle to --- fill the other gaps! 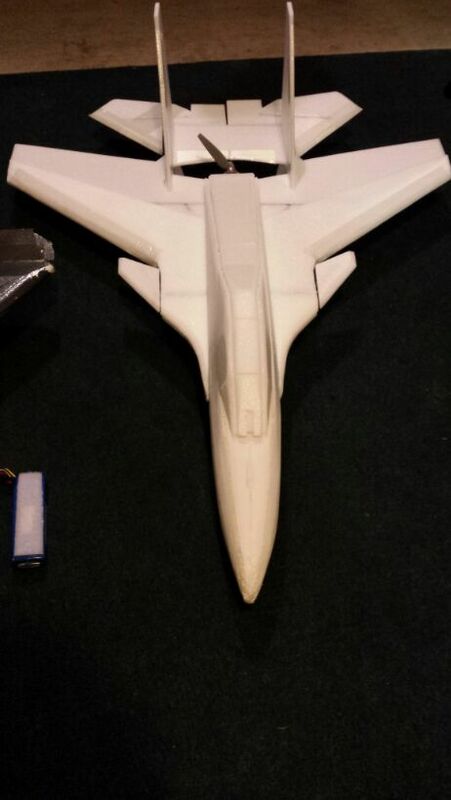 Turned out ok. That was one of our FRCFoamie SU37 mk2 I built for JettaManDan. I use 200 wet/dry. Another good filler is wood glue and saw dust mix. Which GG do you use? Not sure which one to get. I got a high temp gun at Harbor Freight. My daughter calls it Harbor Fright. My wife agrees. Regular white is what I use. The regular-regular (brown) works fine, but has that brown wood tone to it, where white is just barely off white. Both are effectively the same base glue. All the others are just re-branded glues, like superglue and such -- really annoying marketing fluff IMO. Keep some rubbing alcohol and paper towels on hand to clean any excess foaming out -- usually shows up about 5-10 minutes after applying. I went to Lowes today and took a look at some. The bottle say it's "Water Activated". Do you use water to get it to start foaming? If so, doesn't that mess with the paper on the foam-board? Xuzme's right, but all you need to remove is at the joint itself. Nick the paper along the join line and it should peal away from the foam. That and humidity is usually more than enough. If you're in a drier climate, dip your finger in a cup of water and run it over the seam. It doesn't take much to work. Great! Thanks for the information guys. I really appreciate it.